Have any of you ever see that Jim Carrey movie Yes Man? If you have, I've sort of been feeling like the cult of yes people lately. I just feel like I've been taking on a lot, and it's a little bit overwhelming. The other day I was so busy with everything that I forgot that I hadn't eaten dinner and it was almost 10 o'clock. This semester I'm in my junior level thesis class (my major has 4 thesis preparing classes!!) and it's said to be the hardest class in my major, and the rumors are true. I've never struggled with a class like this before. The work is hard, but the amount of work is crippling. I've also been taking a closer interest into the business side of my blog, and have been working harder on it than ever. The amount of free time I had was reduced to my meal times, and that was without adding in my new work schedule for my new job. 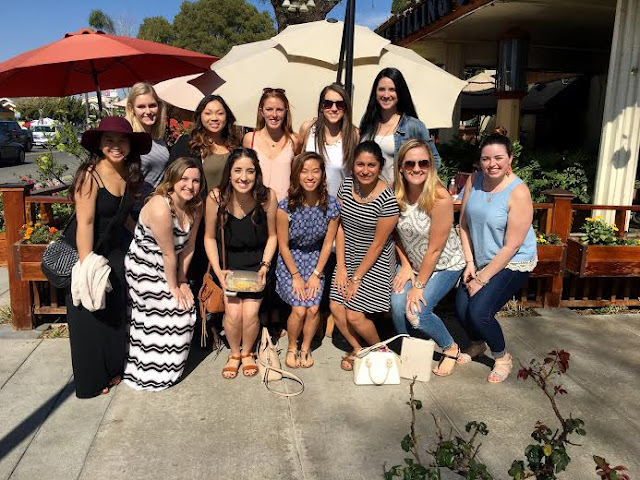 I had gone in for my first real training day super excited about where I was working, and couldn't wait to get to know my coworkers. After my first day though, I basically had a break down a few days later. I was texting my mom about how my day was going and she asked about the days I had been scheduled to work. 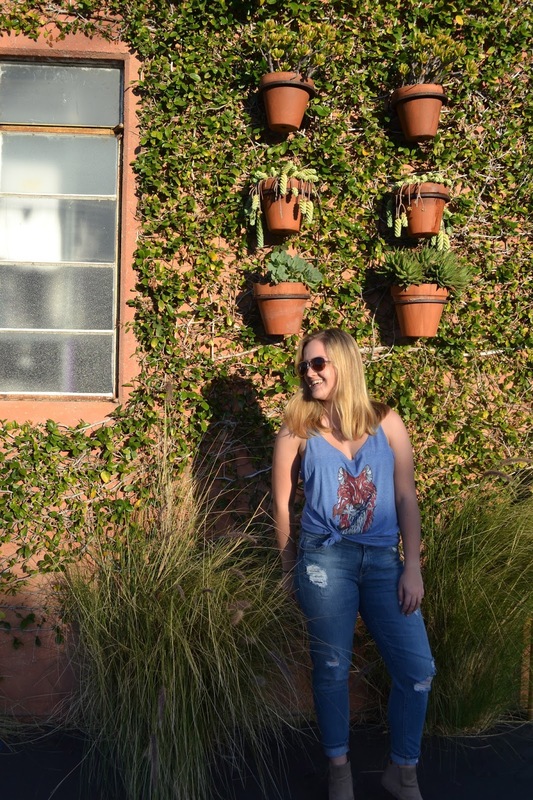 I was assigned four nights in a row essentially right when I got out of school, which at first I thought I could totally take on in stride with my school work and blogging. While texting my mom, however, I realized that I wasn't going to have any time to finish reading a 200 page book, write a paper, social media, blog posts, along with the 20 hours of work and get everything done without making some sacrifices. I was actually at a school extra credit event (#nerd) when I was texting my mom, and after it was over I went to my car and cried for a solid fifteen minutes. I was freaking out that I had too many commitments, but at the same time I was scared of disappointing everyone, myself included. It was time to really weigh my options and make some tough decisions. I talked with a few friends, and had an extremely long and complicated talk with my parents about what I should do. I obviously couldn't drop my class since it's required for me to be on track with my major, so it was more of a discussion on what to do with work, blogging, and managing my time as best I could. My parents suggested asking for less hours at work, but with me already having the minimum number of hours a week, it was highly unlikely that would happen. One of my friends suggested that maybe I stop blogging for a while and I started crying (too much stress for me = sobbing beyond control) because my blog means so much to me, and it wasn't something I could ever give up, even for a semester. After numerous phone calls and skype sessions and a few more tears, my parents and I came to the conclusion that I needed to quit my job. I went back and forth on this decision for a while, trying to talk myself into staying up later or getting up earlier to work on assignments, not going home between classes for breaks, etc. But ultimately I just needed to go against my 'don't give up' personality and let go of what I couldn't take on. I emailed my letter of resignation to my boss explaining my whole situation and just released all the stress I had been building up. Even though that was one of the more difficult decisions I've had to make in a while it really helped me understand that it's okay to not take on everything that comes my way. I need to understand my limits, and not let myself get overworked by trying to please everyone. I'm not the only one who feels like they're overwhelmed sometimes, and I think it's important that everyone understands this. I know I personally get so much relief hearing that my friends are also struggling, I'm not the only one, and that's okay. Especially for those of us in college, our studies are meant to challenge us, and a little struggle will make us stronger in the end. There's a difference between a challenge and having a break down though, so if you're headed towards the latter you may want to take some time to talk things out with friends and family and see what you can do. I'm not trying to make this post sound like "poor Sami, your life is so hard," although it's kind of sounding that way... Really I'm just trying to remind you all that you're not the only one who sometimes has a difficult time keeping your head above water. 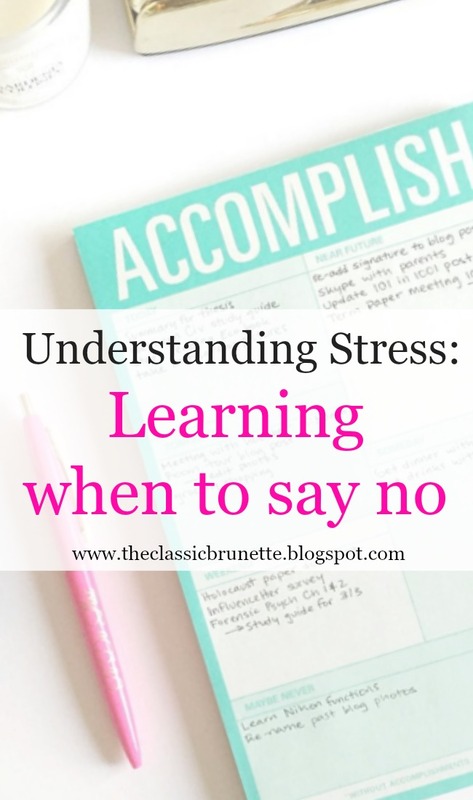 Responsibilities always seem to pile up at the same time, so sometimes you just have to take a step back and say "no" to those extra obligations and have some time for yourself. Strangely enough, one of my favorite ways to de-stress is to curl up in my bed and write a blog post with a soothing candle lit. Take something that you love like reading your favorite book, going swimming, or seeing a movie with your best friend and take your mind off of your work for a little bit. Sometimes just a small amount of downtime can do wonders for your emotional state. The stressful times will come and go, and it's important to find your happy place. 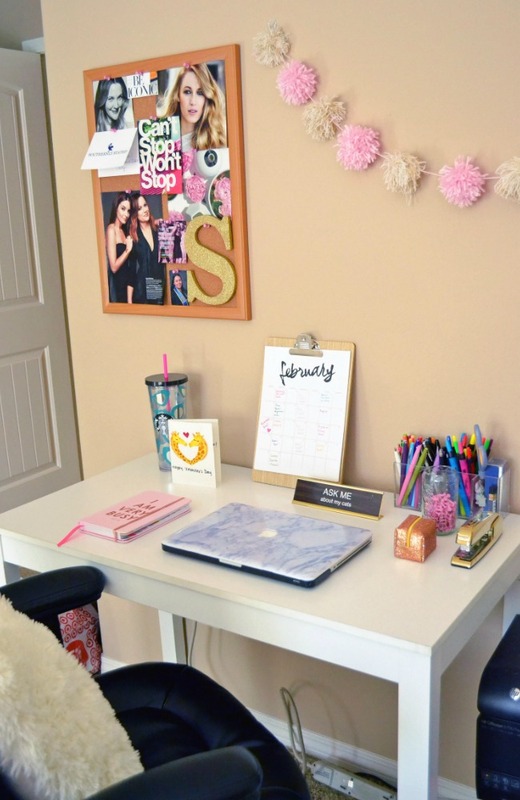 For me its blogging or re-organizing my inspiration board. Find whatever it is that makes you relax and stick with it, you're not the only one, and if others can make it through tough times, you can too! 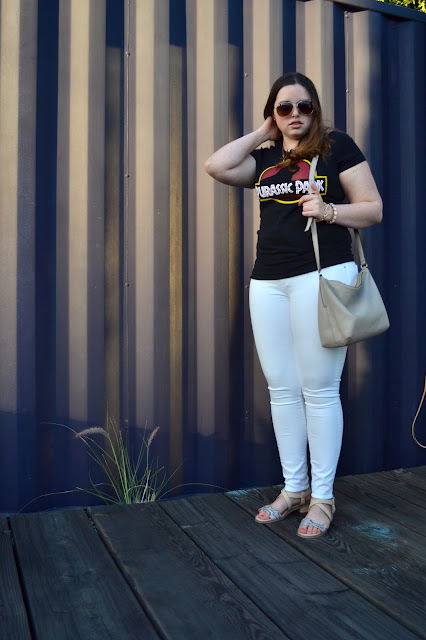 Sorry this post was so long, I kind of dragged on a little bit! Happy almost Friday! 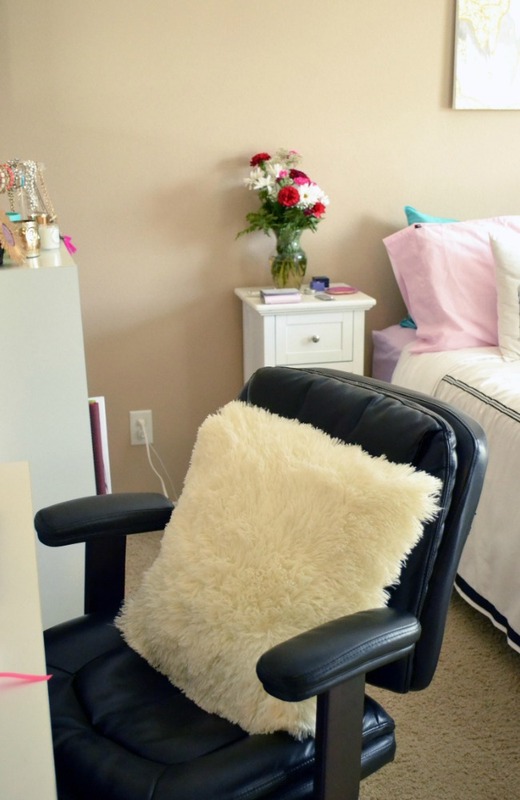 Remember when I posted my closet tour and promised a bedroom tour soon after? Well it's finally here! I was waiting to do one when my decorating was completely finished, although I don't think that will ever really happen, so I decided to clean up my room and take some pictures! My gallery wall is non-existent, but I do have a few artsy things set up. I'm still thinking about adding some prints on the opposite wall of my desk next to the window (not really shown in the pictures), but we'll see if that happens with how busy I've been lately! 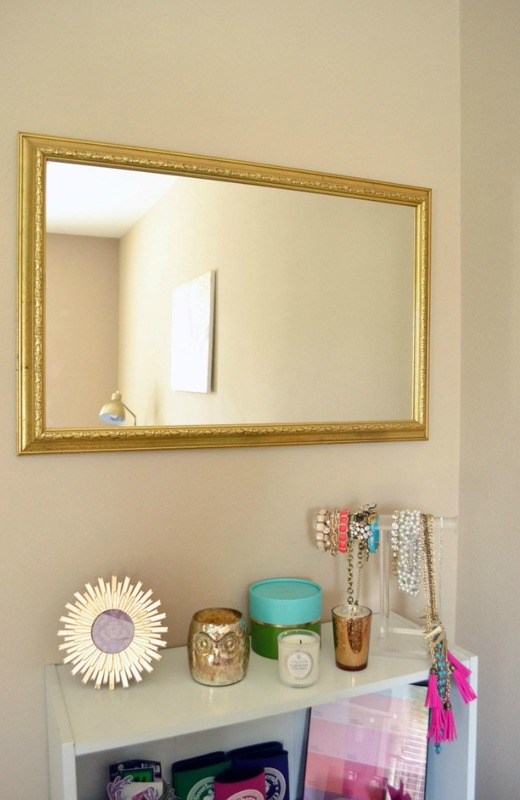 I'm so excited to share my bedroom with you because it's the place where I spend the most time! 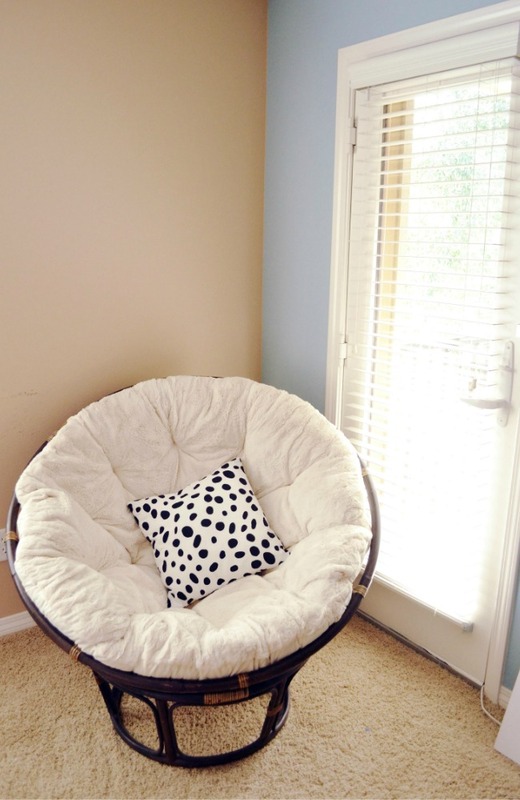 I do all my blogging, homework, relaxing, etc in here. 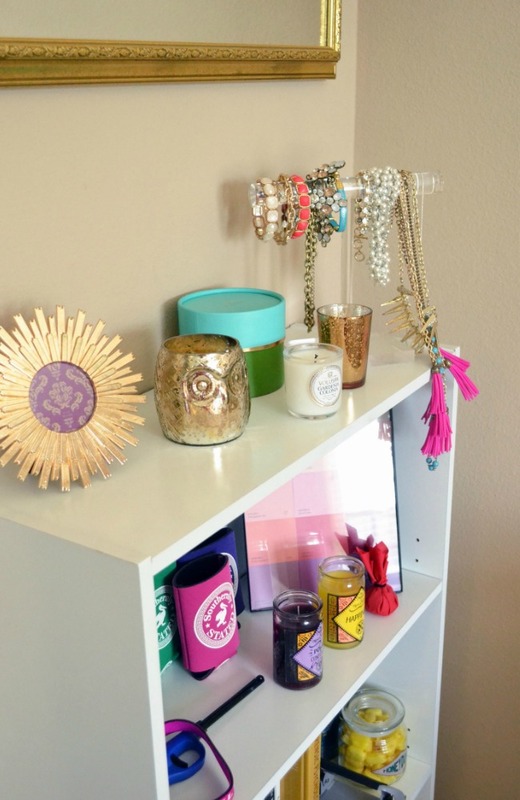 I think by seeing a person's bedroom you get to know them a little better, so I wanted to give you all a little peak into mine. My favorite thing about my room has to be my bed. I think the best tip I've ever been given about decorating is to keep your bedding white (or mostly white) and then decorate around it. Every so often I'll switch out which pillows I'm using, but no matter which patterns or colors I use, it always goes with the duvet! Plus it's very useful when I'm trying to take all white instagrams as it makes for a quick and easy background. 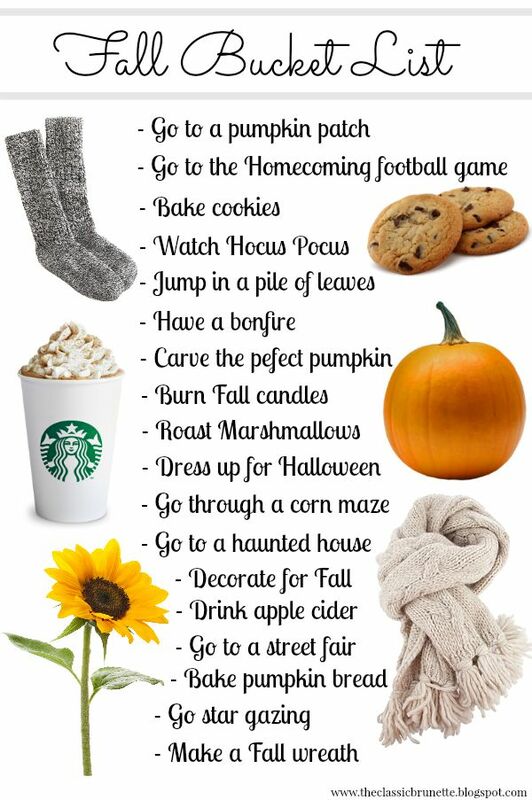 I also think having a white comforter is just so much easier for, well, life. 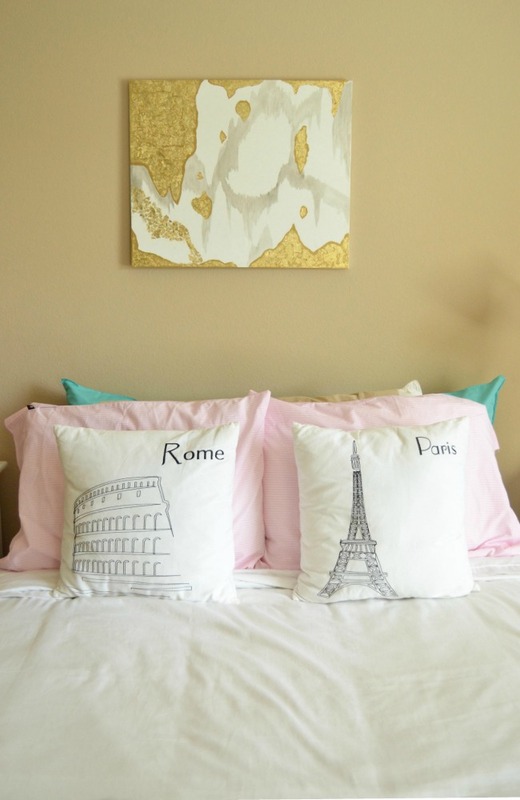 No matter what my future decorating interests are, my white bedding is sure to go with it, so it ends up saving me money in the long run! I don't want to constantly buy a new comforter every time my taste changes within the next however many years, so I think it's good to invest in a neutral one. If you're worried about it getting dirty, don't, it's actually surprisingly easy to keep it clean! Another favorite part of my room is my cork board and all the different things I have up there. I tend to have pictures of different inspiring women, a recent addition to my board is Tina Fey and Amy Poehler! I also keep thank you notes, inspirational quotes, and occasionally pictures or short reminders up there if they aren't on one of my many to do lists. When I'm stressed I have a habit of changing up my board; I think it makes me feel better to reorganize and have a little change of scenery in my room. 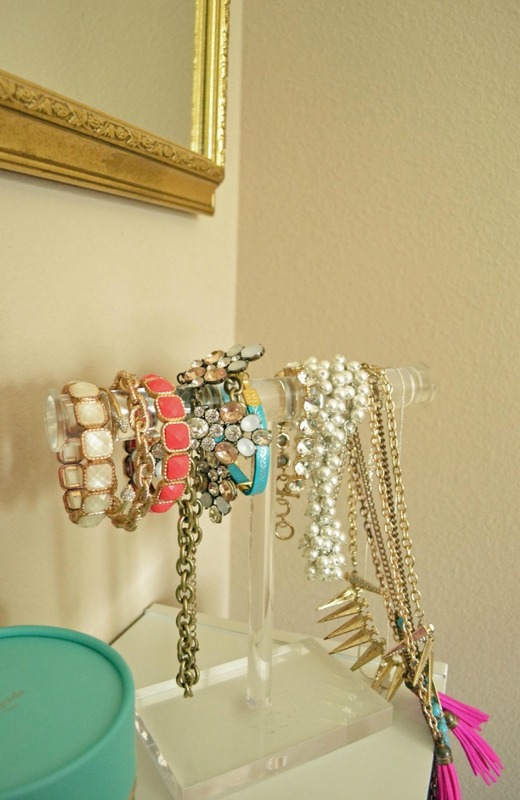 I also love to have a bunch of cute room accessories, even if they don't really do anything. 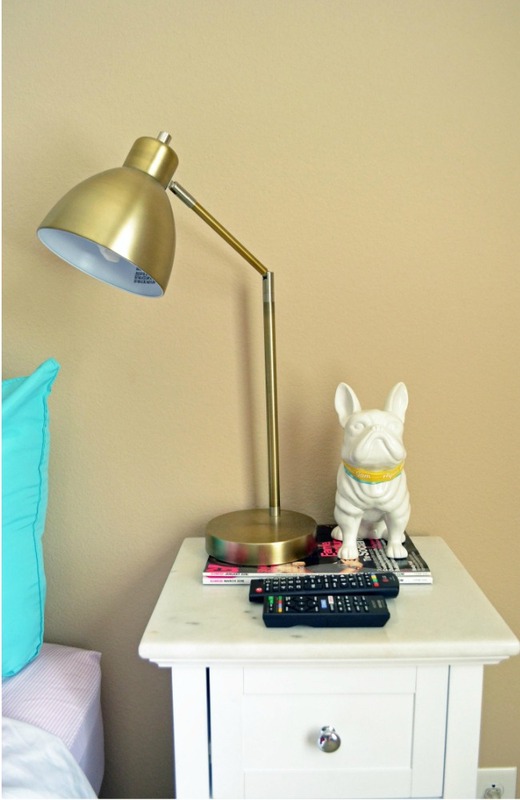 The first thing I actually purchased for my new room was this ceramic french bulldog! Why did I buy it? I don't know, but it had character and I wanted it. I got these pink agate coasters for my birthday and they're also one of my favorite small items in my room, especially with the gold trim! I always have a glass of water at my bedside and before I got them was just using random scraps of paper as coasters (#college). They're so useful though, and everyone always compliments me on them when they see them! I also may or may not have a candle obsession. I currently have six sitting in my room right now and have only burned two of them. Someone tell me if that is a normal amount, I don't know a normal person's candle habits. I tried to link as much as possible for what's in my room, but let me know if I missed something! 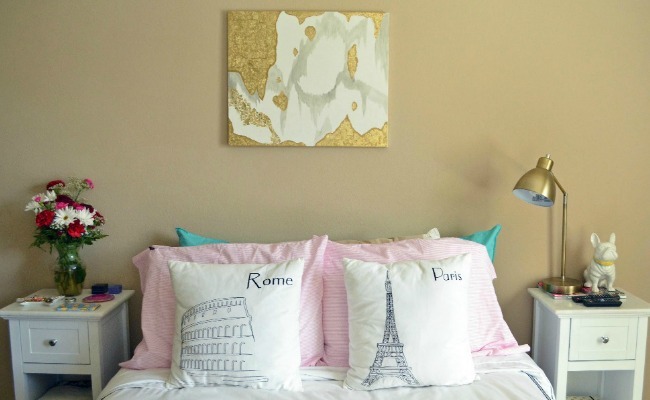 What are your favorite bedroom decorating tips? I worked as a kitten nursery and cat volunteer at my local ASPCA all through high school and it was one of the best things I ever did. I had to stop once I was in college, but I miss it all the time. Working with animals is truly an incredible way to spend your time, especially if you're looking into volunteer work. The kittens I worked with were from about 4 weeks old to a few months, but they were always adorable and exciting. It was really tough having to let them go into the actual shelter and let other people adopt them. The kittens were fun and adorable, but the older cats were always my favorite. When you walked by the cat's cages, each one would get a look of hope on their face as you got closer to them. As volunteers we had a schedule of cats that hadn't been out that day, and used that as the way for picking which cats to take into the play room. I always got so excited watching the older cats who hadn't been loved in a while play with their toys. It sounds silly, but watching these cats while volunteering is one of my favorite memories from my years in high school. I'm so happy I chose to volunteer where I did, even if it made my cats at home a little jealous. I've had pets ever since I was born, and I know just how much animals can make a difference in a person's life. I also know how much people can make a difference in an animal's life. All my cats have been either saved from stray cats or from the animal shelter. My current cats were already on the older side when we adopted them (9 years old! ), but my family makes a point to get older cats, especially those who are black (all my cats have been either black or mostly black) because they're unfortunately the ones that stick around for a long time while in the shelter. Seeing the difference you can make on an animal by loving them and treating them right is one of the best things in the world. After coming to college and having to stop my local volunteering, I'm constantly on the lookout for new ways to get involved with the cause that is nearest to my heart. That's where Arm the Animals comes in. 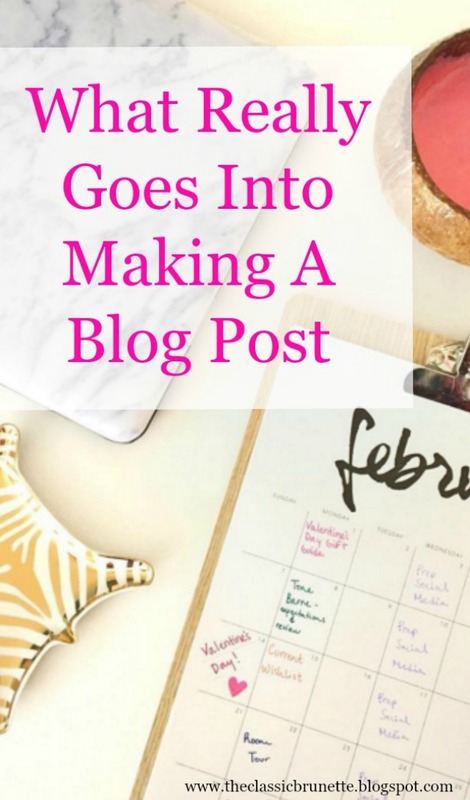 I first noticed them on Instagram and when I had to chance to work with them on a blog post I agreed immediately! 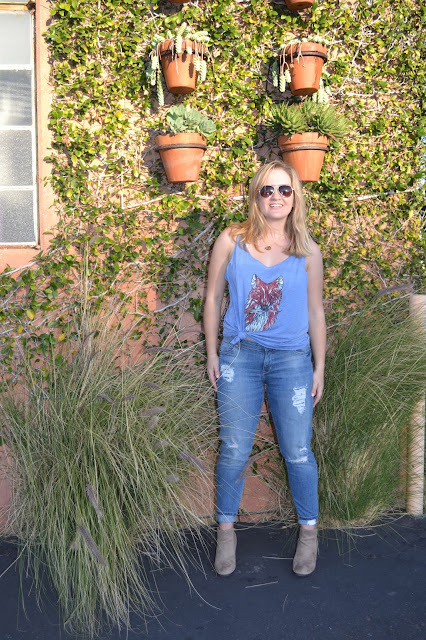 Their mission is to create killer clothing that makes a statement & generates a fund for small, struggling animal rescues. We know we can't save every animal, but we can try! With your support, we can make a difference and help save thousands of animals! 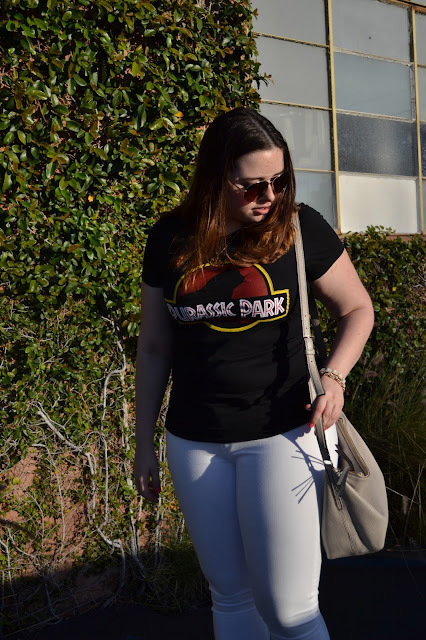 They do this by creating awesome printed shirts, seriously how cool is the Purassic Park shirt I'm wearing? As a self-diagnosed crazy cat lady I was dying to have it! 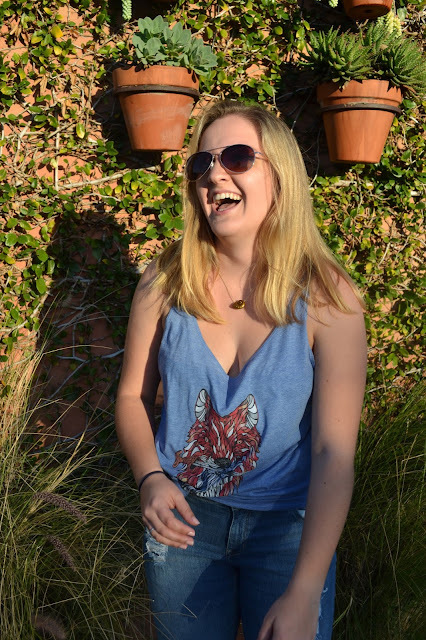 I was looking at the shirts I had been sent and my roommate Steph saw the fox tank and thought it was so cute, so I decided to have her be in the post too! Check them out if you want to support animals while wearing some fun clothes! As a single lady with a good number of single friends, I had lots of gal pal time this holiday weekend. Although I do love Valentine's Day just for the fact that it's an excuse to buy chocolate and flowers, I never really expect too much out of it. I have to say though, I think this was my best Galentine's Valentine's Day yet! 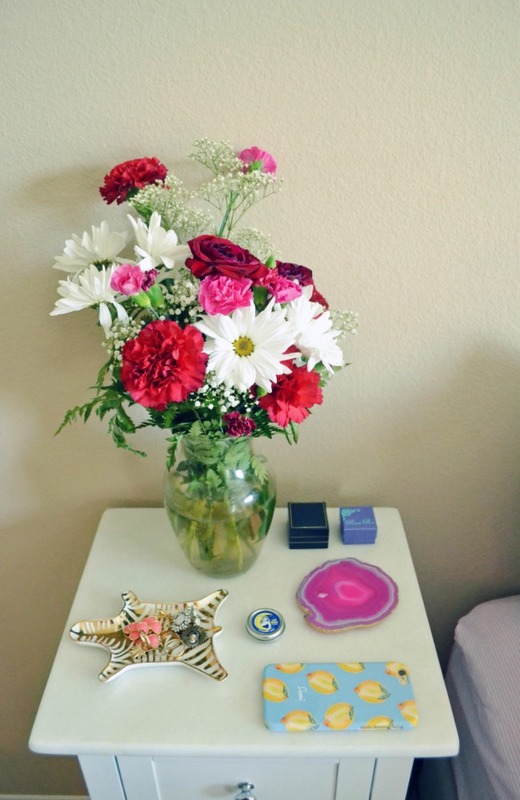 The weekend was a great start to the holiday since my parent's sent me flowers! I was so surprised because one of my other roommates had gotten flowers the day before, and I just assumed these were also for her. It was a great pick me up for the pretty stressful week I was having, and a great start to the weekend. Later that night my best friend and I went to see How to be Single and it was absolutely hilarious! If you're a fan of romantic comedies (and super cute boys!) you'll love this movie. Started off Saturday with a great Galentine's Day brunch with a fun group of girls from my sorority! 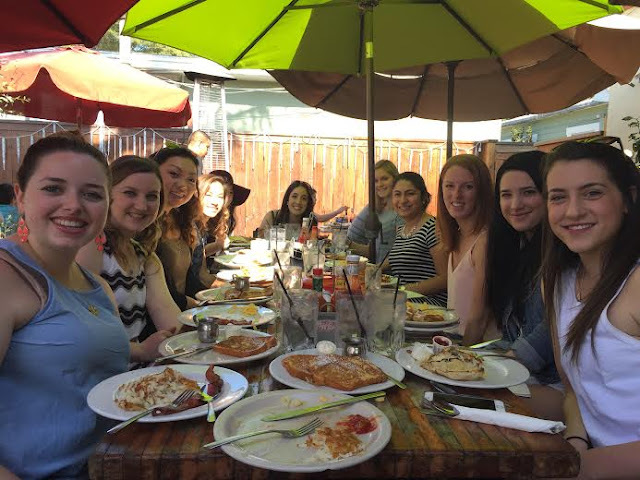 It was so much fun catching up with everyone and eating way too much french toast. If you ever come to the city of Orange, I beg you to treat yourself to breakfast at The Filling Station, it's seriously the best! Thanks so much to my friend Gabriella for organizing it! I woke up this morning to this cute little card slipped under my door! 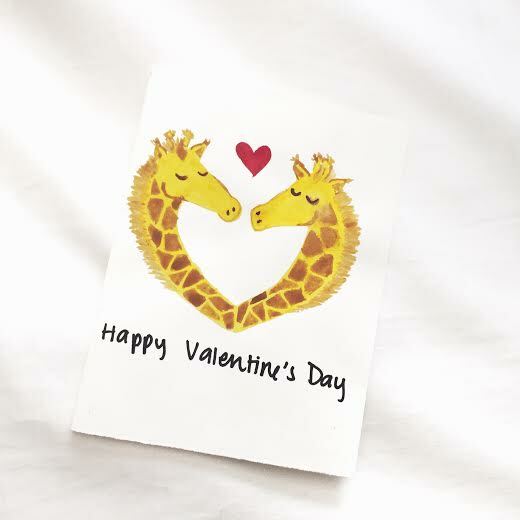 My roommate Nicole drew these adorable giraffes (one of my two favorite animals, cats and giraffes are tied) and there was a funny poem inside. Yet another great surprise to start my Valentine's Day off right. I went to my sorority meeting later in the day and then met up with some friends to go see Deadpool. It was also hilarious, but if you aren't into seeing lots of blood, this isn't the movie for you! Happy Friday! I thought I would do something a little different this week. I'm starting work today (woohoo!) and thought that because I'm a little stressed with that along with beginning my thesis (!!!!) this would be a good time to take a step back and reflect on everything entertaining that I've been reading. 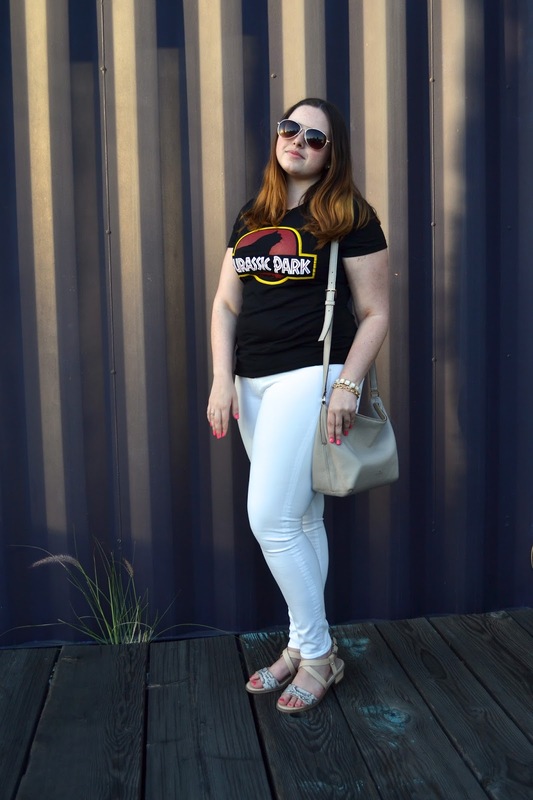 So here are some of the posts that I've really been enjoying recently and think you will too! Feels like Spring with this cute bikini! I hope you enjoy reading these as much as I did! Disneyland has always been a source of happiness for me. I visited the park multiple times from when I was about two all the way through high school, but now that it's around 15 minutes away from where I live and go to school I practically go any time I'm free. Although riding the rides and taking pictures with characters is extremely fun, I love to eat all the delicious food the park has to offer. 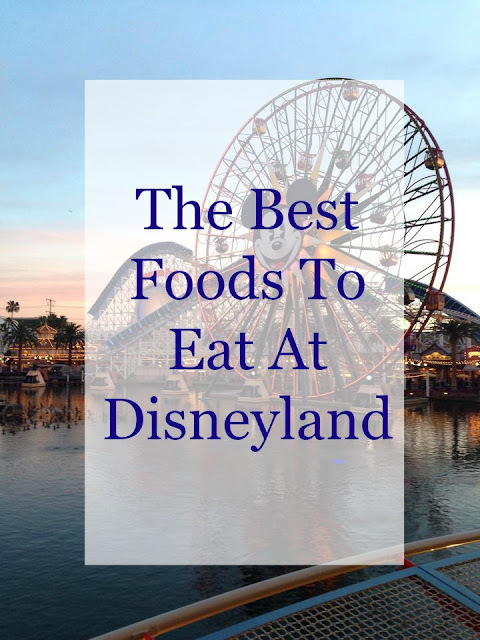 So I've decided to make things easy for you if you decide to visit the happiest place on earth by making a food guide for you all! 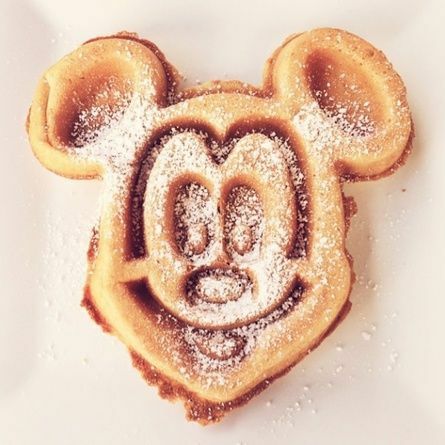 Feeling something a little bit sweeter? 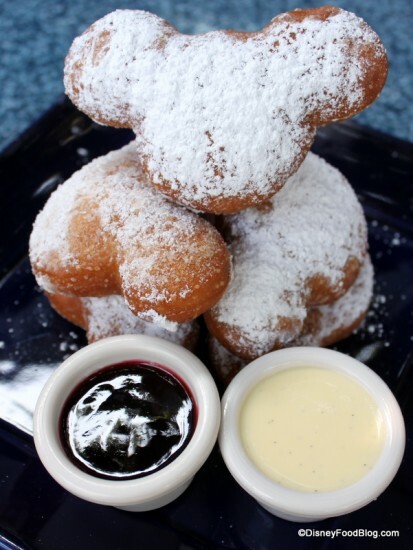 Well then another breakfast option for you is the Mickey Mouse Beignets! What's more sweet than this character shaped piece of fried dough completely covered in powdered sugar? Yes, they can also technically be a dessert, but in my mind these babies are exactly the same as a powdered donut. You can buy some for yourself at the French Market Restaurant in New Orleans Square, and if you happen to be around in the Fall/Winter there may be some seasonal beignets flavors like pumpkin spice. If you know me at all, you know how much I love chicken. (seriously, I will eat chicken for every meal, people have made jokes that I am slowly turning into a chicken) Despite my extreme love of chicken, fried chicken has never been my favorite because it's always difficult for me to get around the bones and it just takes too much effort to eat. 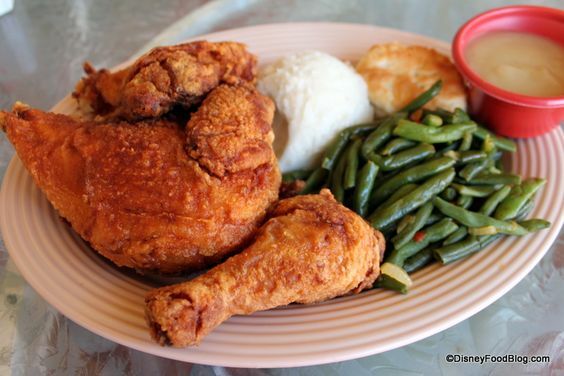 Disneyland fried chicken, however, is a flavorful masterpiece that is worth the effort. It's literally so good that I always walk away from my meal with a smile and a full belly. Insider Tip: If you aren't big on mashed potatoes or green beans, ask to have double of one side. 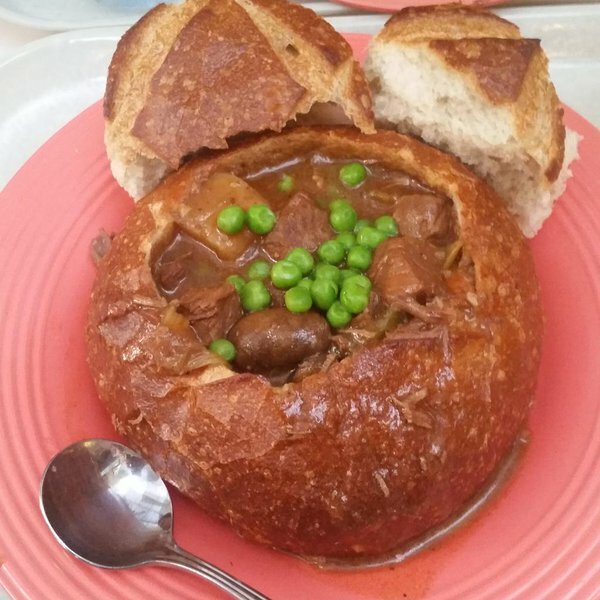 I recommend getting this for dinner since it's a pretty big portion, find it at the Plaza Inn right off main street! 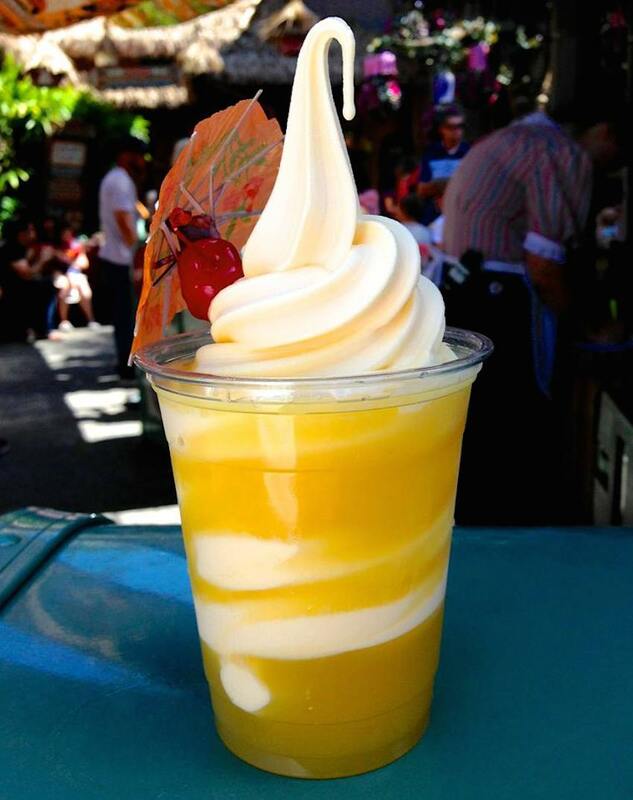 Dole whip is one of the best desserts at Disneyland if you're looking for something unique and refreshing. You can get just the pineapple soft serve or have it with some pineapple juice. Either way, it's delicious, especially during the warmer months. Get one for yourself at the Tiki Juice Bar at the entrance to Adventureland. 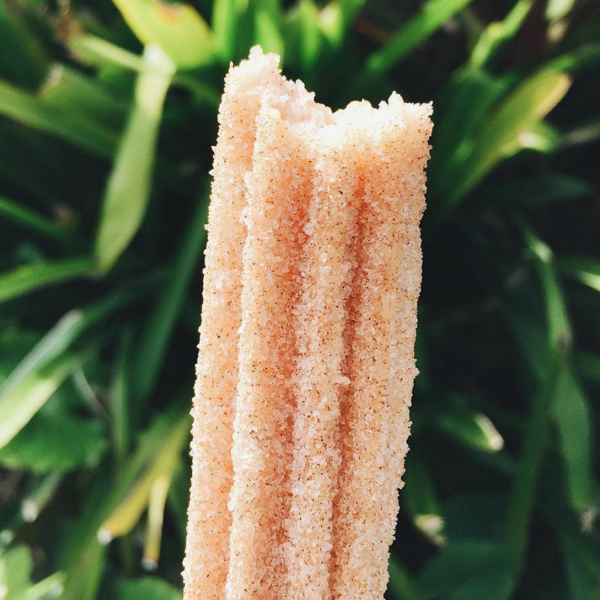 The ultimate Disneyland treat: the churro. When I was younger, I wouldn't leave the park without grabbing a churro. One time when I was around 10, it was almost midnight and all the vendors have closed and I dragged my family around the park for a solid 20 minutes until we found an open one. (no apologies, it was worth it) Seriously though, these are amazing and I kinda wish they made candles that smell as good as they do. 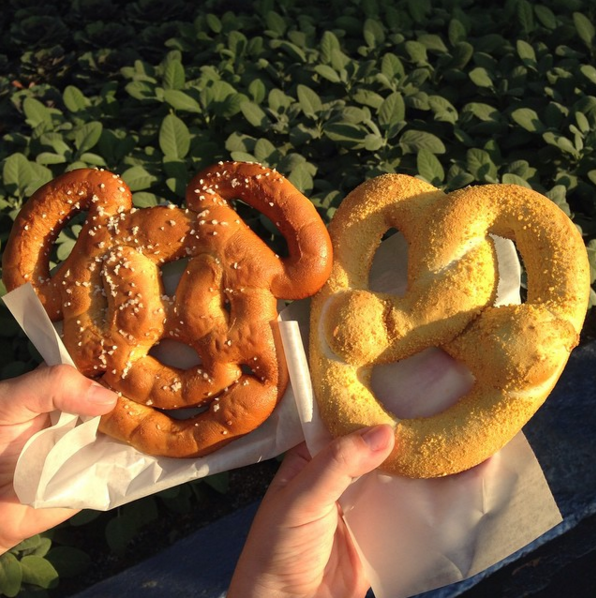 A great snack for waiting in lines, the Mickey Pretzals (or my personal favorite, but not as cute, the cream cheese filled pretzals on the right) are a classic Disneyland snack. I may love my churros, but these pretzals are where it's at. I know there are so many other great foods that I left off of this list, so let me know your favorites below! One of the goals on my 101 in 1001 list is to read 20 books, so what better way to encourage myself and others to read than by making a list! The title of this post is kind of a lie, mostly because I haven't read the majority of these books before. It's really more of a list of books that I want to start reading because others have spoke highly of them, and I'm letting you lovely readers know about them as well. 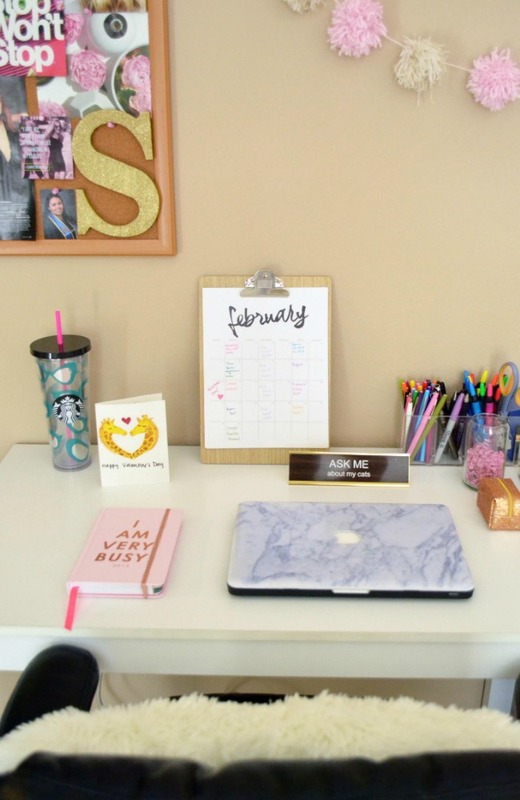 Some of these are specifically for bloggers, but most are just good books. 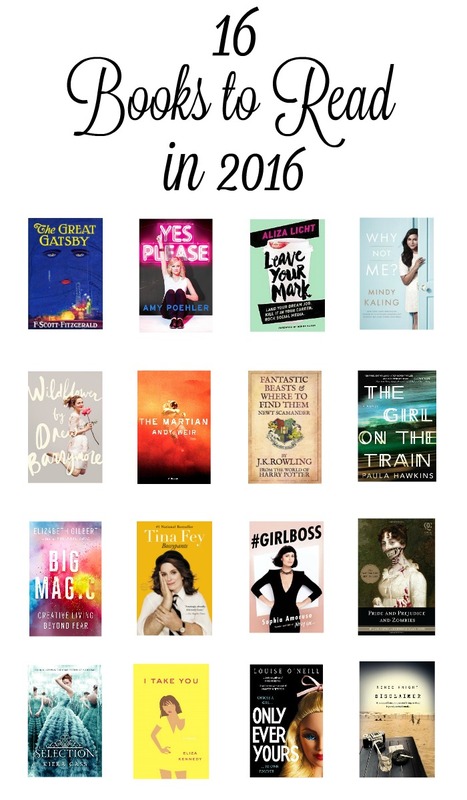 Essentially it's more of a reading bucket list for the year, nonetheless, I hope you enjoy! Gatsby became one of my favorite books after I had to read it in high school, and I've been meaning to re-read it for some time now. I highly recommend it to anyone who loves a good read. You could just go and see the movie, because who doesn't like to stare at Leonardo Dicaprio for two hours, but it doesn't do the book nearly enough justice. Another one of my favorites that I would love to read again. Amy Poehler seems to really get me with this book, down to the details of using laughing gas at the dentist's office so I don't have to see a needle! (Seriously, that's in the book and it's too true.) Hilarious and heart-warming all at once. A book that the blogging world can't stop talking about. From what I gather it teaches you how to make a successful career out of your passions and slay in social media. The author was one of the first in the fashion industry to really invest in the impact of social media, and obviously it made her a huge success! Am I the only one obsessed with everything that Mindy Kaling does? I love her on the Mindy Project, can't get enough of her on instagram and twitter, and I've been meaning to pick up her book for a while now. Another pretty lady that I'm completely obsessed with. Drew Barrymore can do no wrong in my eyes, and I'm anxious to read her book. It's the first time she's written about herself since she was young, and I know a few stories about her, but am dying to read them from her point of view. Have you seen the movie yet, because I have, three times. The movie is Oscar nominated, and for good reason. I gave the book to my dad for Christmas and he really enjoyed it, and it's next on my reading list. I absolutely loved the movie and how Matt Damon portrayed the character so I can't wait to see how it compares to the novel. The film adaptation is currently in production, and I honestly don't remember if I've read this or not, so I think I'll just have to pick it up again to make sure. How can you go wrong with anything in the Harry Potter universe? People are calling this book the next Gone Girl, and although I never read it, I did watch the movie and it was crazy! I've heard so many great things about this book, so it definitely earned its place on this list. Another book from the blogosphere that is getting quite a good reputation. The book is full of Elizabeth's wisdom on being creative and how to inspire yourself to live your most creative life. I love that there are so many female comedians writing books about how to take control of whatever situation you're in. Tina Fey is another one of my favorite comedians, and Bossypants has also been on my bookshelf waiting to be read. This book isn't new this year, but it has so many bloggers going crazy about it. Nearly every blogger who I've talked to raves about this book, and I can't wait to pick it up this year. Set to become a movie this year, this interesting take on the classic Jane Austen novel seems, well, really cool. I haven't read the regular pride and prejudice, and I only just watched the movie a few days ago, but I think this would be a great read. Something totally different than anything I've ever seen. As some of you may know from reading my recent tweets, I've been a little obsessed with the show Reign. So obsessed in fact, that I googled some books that are similar in style to the show. The Selection series came up in many results, and so I believe I'll have to add them to my list now. This book has been sitting in my bookcase since the beginning of summer, but I just haven't gotten around to it. In all honesty, I don't remember what it's about, although it had to be intriguing enough for me to buy it from Barnes and Noble! Apparently this book is like a bigger and badder mean girls with a little bit of influence from the book The Handmaid's Tale. It's basically a novel filled with haves and have-nots, and lots of drama. One of my guilty pleasures is reading the extremely cheesy, drama filled books, and this seems like a fantastic one. This is the most interesting book on this list. It's about a girl who picks up a murder mystery novel and where she happens to be the main character. Think of the movie inception but creepier. Are any of these books on your reading list? Did I miss a book that should definitely be on this list? I love Valentines Day. Even though I've never had a significant other to share it with, my parents always made it a special day while growing up. Before school they would give my sister and I a little stuffed animal or box of candy and a card. I'm so happy my family made this day special for my sister and I because it never made me feel like I was missing out on anything. I've never had a boyfriend on Valentine's Day, or ever for that matter, but I still have a special place in my heart for Valentine's Day. My parents kind of instilled in me that Valentine's Day isn't just a day for your boyfriend or girlfriend, but a day to celebrate everyone you love, and I think that's a great way for everyone to look at the holiday. 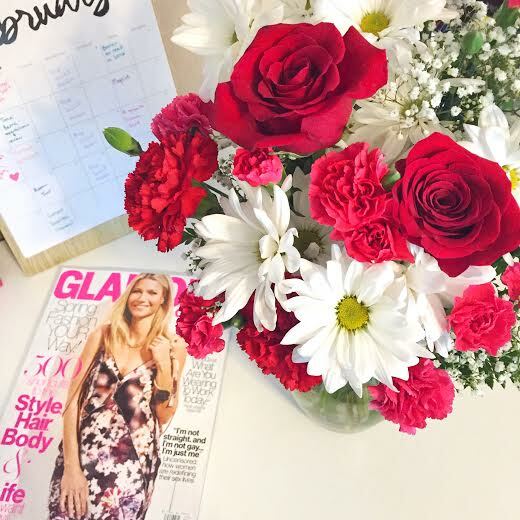 Last year my friends and I had a Galentines Day, and I think we're planning on doing the same this year. You don't have to give gifts to let people know that you care about them. (Although it doesn't hurt!) Just a simple card or a little bit of candy to say you're thinking about your friends on this day is a great reminder of your love for them. For the past few years my mom has even sent little bags of candy for me to hand out to my roommates, and I know they appreciate it. A little goes an awful long way, and I think it's never a bad thing to show that you care for someone. However, if you're in the mood for some bigger gifts, I've got my gift guide for you! I love getting fuzzy socks, just because I like to slide around on my hard floor with them, and they're so dang soft. And I can never complain about getting nail polish as a gift since I paint my nails so often. 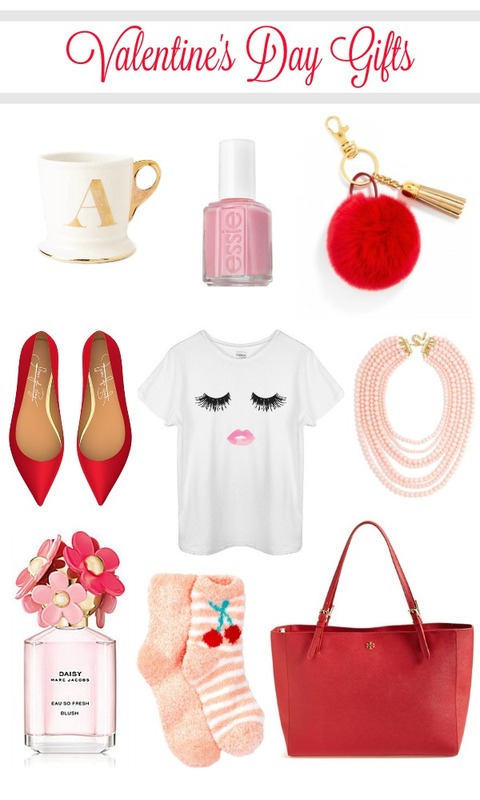 My favorites here though are the Lips and Lashes tee and the Daisy Eau So Fresh perfume!